John Esau's life was divided into three separate careers, one as missionary to Africa, another as professor of education, and a third as farmer-entrepreneur during his lifetime of 72 years. John was born to John J. and Katarina (Wiens) Esau on 3 January 1926 in Kleefeld, Molotschna, Ukraine. He was the eldest in a family of seven sons and one daughter. This family joined the emigration to Canada in 1927, farming first in Manitoba for three years, then fifteen years in Coaldale, Alberta, before taking over a diary operation near Chilliwack, BC, in 1945. John joined the Coaldale Mennonite Brethren Church by baptism in 1942. He attended Bible school first in Coaldale and then in Yarrow, British Columbia. High school studies were also taken in Yarrow before moving on to do the Bachelor of Religious Education degree at Mennonite Brethren Bible College (MBBC) , Winnipeg, Manitoba. Like many others he completed his BA degree at Waterloo College, but added an Ontario Teaching Certificate in the early 1950s. 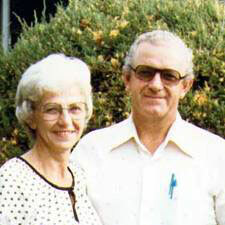 John met Agnes Suderman from Port Rowan, Ontario, at MBBC and they married on 25 August 1951. 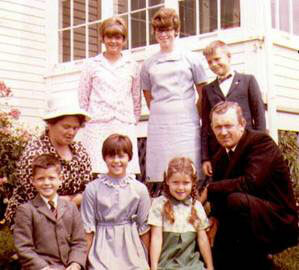 They had six children: Mary Lois, Kathy, Irwin, Laurel, Carl, and Lilian. The first two and the last were born in Canada, the others in the Belgian Congo between 1954 and 1960. The three parts of John's career were somewhat determined by world events. He and Agnes prepared for service with the Mennonite Brethren mission in the Belgian Congo and served there until the revolution against the Belgian government in the Congo forced the Mission to evacuate in 1960. On the family's return to Canada John earned a Master's Degree in Education and was began teaching Educational Psychology at the Nova Scotia Teacher's College, Truro, in 1962. Although John held this position for the next 18 years until cutbacks forced his departure, he had meanwhile (in 1963) acquired a farm home with considerable acreage near Debert, about 20 kms from Truro. Some hectares were forested, but the rest of the acreage was suitable for berries, especially blueberries, and vegetables such as carrots. During these years John also served as key local person in the Maritimes for the Christian Service program of the General Conference of Mennonite Brethren Churches, helping to place teachers and nurses wherever this was possible. He took every opportunity to attend MB conferences held in the West and invited those he met there to stop at the family home in Debert. Agnes's guest books list a phenomenal number of visitors, both as tourists and as Mennonite Brethren leaders who came to consult about launching Christian Service as well as MB church planting in the Maritimes. One of John's favorite stories was that when he was driving into Truro he was planning his lecture, and when he was driving home to the farm he was planning how to employ his family in the jobs that needed doing at the time. John relied heavily on Agnes and the children to care for and harvest the berry crops while he was away at conference or meeting with berry growers. These extra burdens delayed Agnes' attempt to fulfill her educational aspirations until about 1972. Unfortunately Hodgkin's disease ended her studies at Mount Allison University and she died two years later. John then married Sophie Quiring, a nurse from Saskatchewan who worked in Halifax first under the Christian Service program. This was in 1976 and John hoped one day to return to Africa. Nothing could shake his conviction that he should in some way share the Gospel whether at home or abroad. His release from NSTC in 1980 made this possible and he and Sophie did three short-term stints in the Republic of Congo, all before Mobuto was ousted from power in 1991. One of John's passions had been to train Africans to work among their own people. For this John had prevailed in the development of a Bible school at Panzi, near the Angolan border. This became a controversial issue in the Mission because many considered this school to be too far removed from the center of the Mennonite Brethren work in Zaire. After those terms John and Sophie did a stint of voluntary service at Lithuania Christian College. Then, while Sophie started a bed and breakfast service at the Debert location, John returned once more, now to the Democratic Republic of Congo with the Church Partnership Evangelism Team, headquartered in Abbotsford. There he died of a heart attack on 9 May 1998. His body was brought home and the burial and memorial service was held at First Presbyterian Church, Truro, attracting a large gathering of family, friends, and community. Missionary Album. Hillsboro, KS: 1954. Penner, Peter. No Longer at Arm's Length: Mennonite Brethren Church Planting in Canada. Winnipeg, MB: Kindred Press, 1987: 113-118. Available in full electronic text at: https://archive.org/stream/NoLongerAtArmsLengthMBChurchPlantingInCanadaOCRopt?ref=ol#mode/2up. Penner, Peter. "Christian Service in Nova Scotia - A Decade Later." Mennonite Reporter (22 July 1974): 7; (5 August 1974): 7. Penner, Peter. "Nova Scotia Experiences the John Esaus." Mennonite Reporter (17 March 1975): 7. Rezoni, Azzo von. "Fashion's Fickle: People are now Looking to Country Life." [Truro] Daily News (7 February 1976): 1, Lifestyle section. Penner, Peter. "Esau, John (1926-1998)." Global Anabaptist Mennonite Encyclopedia Online. 2005. Web. 22 Apr 2019. http://gameo.org/index.php?title=Esau,_John_(1926-1998)&oldid=163616. Penner, Peter. (2005). Esau, John (1926-1998). Global Anabaptist Mennonite Encyclopedia Online. Retrieved 22 April 2019, from http://gameo.org/index.php?title=Esau,_John_(1926-1998)&oldid=163616. This page was last modified on 11 March 2019, at 02:08.